Greetings from Prague!!! So excited to be here, this city is AMAZING. Today we have Megan guest posting with a fabulous Christmas recipe from Norway! Awesome, right?! 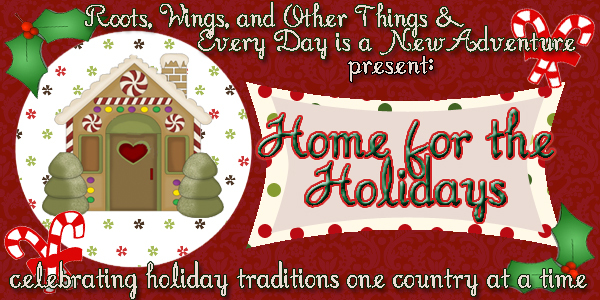 Be sure to check out her blog as soon as you read this, and don't forget to go visit Daryl to read about some Norwegian traditions! Hi everyone! This is Megan from A Suitcase and Stilettos. I am an American living in western Norway and am excited to share with you a simple recipe from my new home. Since moving here, I have come to the conclusion that Norwegians go nuts for gingerbread. I am not even kidding! The smell and the cookies can be found everywhere. Even the world's largest gingerbread city, Pepperkakebyen, is located here in Bergen, Norway. And since Christmas is right around the corner, I thought it was only appropriate to share a common gingerbread recipe with you. Cream butter and sugar until white. Add cream and blend again. Mix the baking soda in a little water or coffee and add to flour mixture. Sift spices and baking powder. Add the dry ingredients to the wet and mix until a nice dough forms. Using a sheet of parchment paper, roll the dough into a 2½-inch diameter long sausage. Twist the ends of the parchment paper to seal and refrigerate to chill—at least 4 hours. Unwrap the chilled dough and cut into thin slices of about ¼ inch. Bake on lightly greased cookie sheet at 375°F for 6 to 8 minutes. Remove from the oven, completely cool, and store in an airtight container. Luckily if one does not have time to make these delicious cookies from scratch, one can just head to any grocery store here and buy pre-made dough for super cheap. Hope you enjoy and god jul og godt nytt år!!! Special thanks to this site for the recipe. wait, maybe i have. i forget what germany has and doesn't have. i also forget what does and doesn't exist in america. clearly, this bi-continental lifestyle has turned me into a real mess.